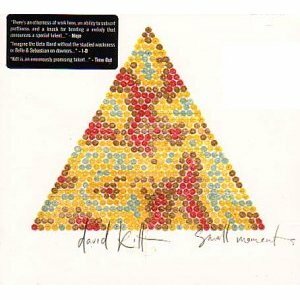 The eagerly awaited debut album from the rising star that is David Kitt was finally released last Friday, 11th August. Up until now the only recordings available from David Kitt were 'Song From Hope St' and 'Irma Vet'. The former was on the 'Come up to the House' Ep, the latter on the Road Relish Singles Club. His debut album is entitled 'Small Moments' and is a collection of seven songs released on Rough Trade Records. The best thing about this album is its simplicity. All the songs are home-recordings done on Kitt's own equipment and as a result of this they are very pure and raw. The first two tracks 'There are Words' and 'Sleep Comes Forever' are laid back tunes with gentle but insistent beats and softly whispered lyrics. 'Step Outside in the Morning Light' showcases David Kitt's fragile voice to gorgeous effect, alongside dreamy flute provided by Mick Fleming. One of the highlights of this short album is 'Another Love Song' - which is by no means just another love song. A beautiful song in its own right, this version is made even more fine by the addition of David's kid brother Robbie, who provides haphazard backing vocals with his sweet voice. The last track on the album 'Headphones' is another real treat. Starting off ever so slowly, this song picks into a very catchy and complete tune. This song is perhaps an indication of how David Kitt's music will sound when it is studio produced. We won't have to wait too long to find out if this is the case, as Kitt is already working on his second album, which will be studio-recorded this time. For the moment though 'Small Moments' will more than suffice, a short, sweet gem of an album.